“A teacher is always trying to start something,” says Thomas Tracy. Tracy, the college’s Phillips Professor of Philosophy and Religious Studies, doesn’t mean a fight necessarily, but rather the philosophical sense of argument that involves an exchange of views backed up by reasons. He describes himself as an agent provocateur in the classroom. When Tracy does “start something,” he does it with humor and respect for how difficult it can be for students to analyze religious texts. 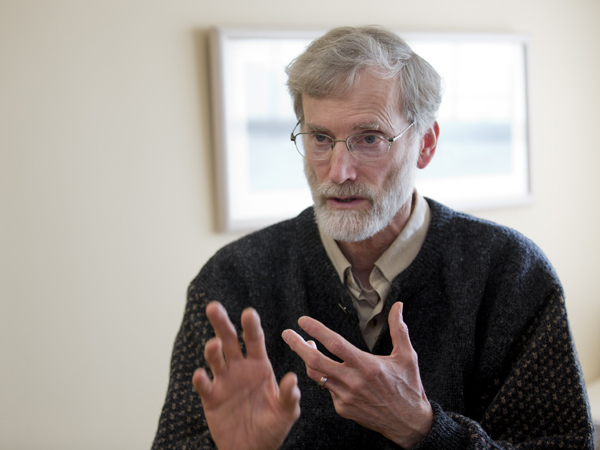 NOTE TO READERS: Thomas Tracy’s Kroepsch Lecture, Creation, Evolution and The Problem of Suffering, takes place at 4:15 p.m. Tuesday, April 2, in the Edmund S. Muskie Archives, 70 Campus Ave.
Tracy’s deft skill at this task has been acknowledged with the college’s 2014 Kroepsch Award for Excellence in Teaching, established in 1985 by a gift from Robert Kroepsch ’33. Nominated by students and alumni, recipients are selected by a committee of previous years’ winners. Tracy will give his Kroepsch Lecture on the public debate between the Christian teachings of creationism and the scientific theory of evolution. The lecture, Creation, Evolution and The Problem of Suffering, takes place at 4:15 p.m. Tuesday, April 2, in the Edmund S. Muskie Archives, 70 Campus Ave. For more information, please call 207-786-6066. His lecture reflects the idea that “something about our particular culture keeps this endless controversy between evolution and creation going,” says Tracy, who studies the relationship between religion and science. This debate tends to focus on the age and origins of the earth, but Tracy intends to show that such a framework fails to address the fundamental issues at stake. John Smedley, professor of physics, teams with Tracy to teach “Caring for Creation,” an interdisciplinary course that looks at both science and religious thought to understand how people conceptualize the natural world and the origins of our universe. For their students, they model the idea that it’s OK not to know something. “Something could come up that Tom brings in from his expertise that I don’t really know about, and then we can have a conversation about it,” says Smedley. It’s the intrinsic value of what we do that makes for a richer and more interesting life. Alex Hamilton ’14 of Truckee, Calif., conducted an independent study on environmental ethics with Tracy. “He asks his students big questions, and he encourages them to respond with bigger ones,” Hamilton says. Olivia Boueri ’16, an environmental studies major from Dubai, took Tracy’s course on the history of Christian Thought last semester. Tracy began teaching at Bates in 1976. He holds a bachelor’s degree from St. Olaf College and a doctorate from Yale. He is a scholar of Christian thought and environmental ethics and is the author of The God Who Acts: Philosophical and Theological Explorations (Penn State University Press, 1994).